A rich history abounds in Tallahassee, the capital city of Florida and guardian of the state's “Forgotten Coast.” Much is hidden in plain sight in this jewel of a Southern city, making Tallahassee the perfect location to enjoy a truly unforgettable Labor Day weekend. Not sure where to begin your adventure? Check out these fun things to do in Tallahassee on Labor Day! Get your feet wet in Florida’s history and local lore at the Museum of Florida History. While Ponce De Leon and De Soto are celebrated throughout Florida, you might be more surprised to learn about (but not as likely to forget) a lesser-known Tallahassee icon. You can meet and stand in awe of the 11 ft. tall mastodon affectionately named Herman that greets you just inside the museum entrance. Admission is free. A cultural adventure awaits everyone who visits the Railroad Square Art Park. With more than fifty well-supported galleries, museums, and shops that wind throughout this venue, it’s best described as a flourishing Tallahassee art scene. And what can be more fun than browsing Railroad Square art? Dining in one of the park’s cafés that is made from a railroad car caboose! At St. Marks and St .Vincent National Wildlife Refuge, September heralds the return of autumn along with the bald eagles’ nesting season and the appearance of fiery fall wildflowers to paint the landscape. You can enjoy scenic walking trails, picnics, educational opportunities, and many other activities at this refuge in Tallahassee. 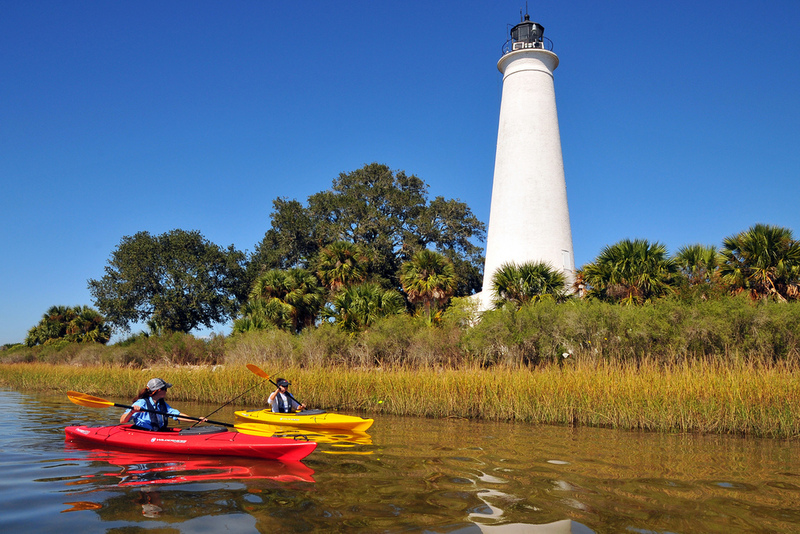 Beautifully situated on a slip of land where river meets Gulf, St. Marks Lighthouse welcomes you to the edge of St. Marks and and St. Vincent National Wildlife Refuge and the winding estuaries of the Big Bend area. Don’t forget your camera or smartphone as you'll want to share the breathtaking views of this inspirational seascape. You can also visit the recently added lighthouse museum. The cheerful and relaxed surfer vibe at this local eatery guarantees to delight. Rest your land legs while feasting on waves of fresh seafood, tacos, steaks, and much more served daily at Cabo’s. Appetizers include the Peppered Ahi Tuna and Tequila Poppers, and the restaurant also has a complete kids menu. Another reason to dine on dry land at this heavenly beach shack is their signature Shipwreck Margarita! St. George Island has all of the amenities you need for a memorable day at the beach. Just south of Tallahassee, the uncrowded pristine shores along this 22-mile barrier island will take your breath away. You can also visit the island’s lighthouse or the St. George Island State Park that occupies the eastern side of the island. Engage all five senses as you step into this historical hands-on site that is the Mission San Luis De Apalachee. Enjoy this reenactment of peaceful village life as shared by the Apalachee and the early Spanish explorers. The main Indian building, the church, and the fort form the foundation that binds these two striking cultures together forever. Getting to know all about Tallahassee is a breeze when you take the insightful All Aboard Capital City Tour. With downtown stops ranging from museums to art galleries, restaurants, and historic cemeteries, you’ll feel like a local in no time, or 90 minutes or less, to be exact. On this tour, you’ll hop aboard “Wilma," an electric tour golf cart for this light and breezy “wheeze” through the city. With so many memorable locations to visit, there's no better time or place to rewind than on Labor Day in Tallahassee. For more information about things to do in Tallahassee, register on 850area.com and connect to everything Tallahassee has to offer.